Airbnb may face significant legal headwinds in some cities over its repurposing of apartments as short-term rooms-for-hire, standing accused of hurting local economies and contributing to rising housing unaffordability. But the tech company’s status as a dangerous player that could dominate the hospitality industry is as strong as ever, according to a new report. Still privately owned and valued at $30 billion, the San Francisco-based company is now the second-most valuable lodging company, according to a report from Macquarie Research. But most importantly, it has the largest amount of accommodations, with more than 3.1 million rooms. It’s a staggering number. The next-biggest lodging company by room count, and most valuable at $32 billion, is Marriott (MAR), with just 1.1 million—two-thirds less. It’s no secret why: As a tech company, Airbnb is able to serve as middleman for people with open rooms, making the supply seemingly infinite. For the company’s aggressive revenue goals, it’s also an auspicious strategy because there are two customers being served: the room providers and the guests. Airbnb hopes to reach $10 billion in revenue by 2020. According to the report’s projections, Airbnb’s room supply growth will outpace the traditional hospitality industry significantly, even as far out as 2020, when Airbnb’s status as newcomer will have tapered. 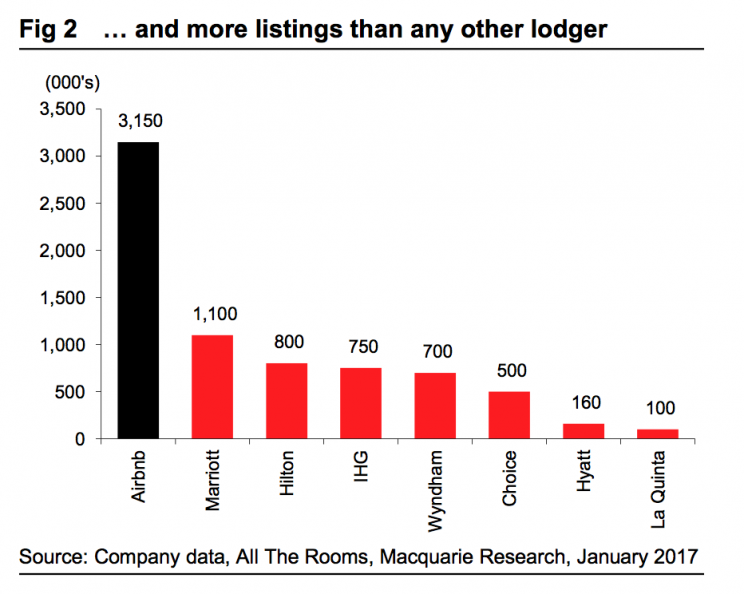 Currently, Airbnb’s lodging portfolio mix is mostly full lodgings, but about a third consist of private rooms. Macquarie notes that 47% of these whole-home listings are apartments, but the significant (39%) house numbers corroborate many views that Airbnb and other home-sharing companies like HomeAway and VRBO (Vacation Rental By Owner) are a whole new product, unique from hotels. You can’t rent a hotel-house and split the rooms and costs. In the scope of the entire market, not compared to a specific hotel company, Airbnb maintains around 3% of national room supply, and is concentrated in urban areas, though not always. While the company accounts for 7% of available rooms in New York City, it has just 1.6% in Washington, DC. Echoing the concerns of residents in many cities over Airbnb zapping housing supply, driving up costs, commercial Airbnb operators appear to be more threatening to the hotel industry, because they often buy a lodging for the express purpose of rental. One way to separate out those listings from rooms or full lodgings rented for supplemental income is to look at availability—which will be higher for commercial options. According to the report, around 17% of Airbnb listings are available 360+ days per year, 60% over 270 days, and 78% over 180 days. This suggests a significant amount of Airbnb listings, though not those figures themselves, are commercial – not individually owned – competing directly with hotels. Supplementing that data, the report found that around 40% of the listings in the 10 major cities tracked by the report have hosts with multiple listings—and 25% across the US—which similarly reflects a substantial number of properties that could cannibalize the hotel business. Survey data from DG-Research.com shows the biggest target is on the backs of midscale hotels. 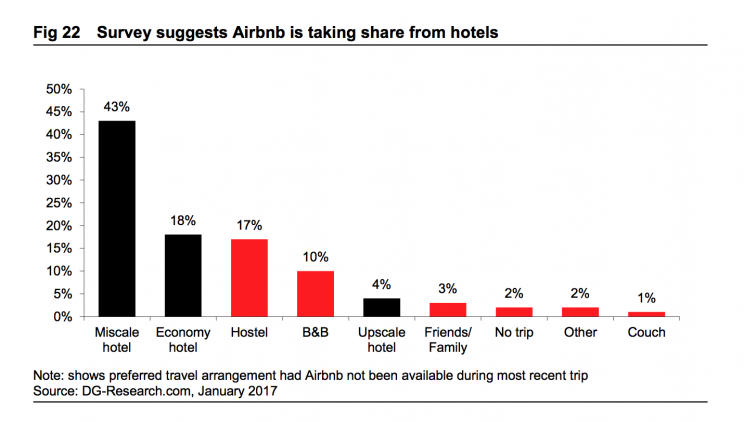 Around 43% of Airbnb guests would have chosen midscale hotels, compared to just 4% that would have chosen an upscale hotel, and economy hotels, which were replaced by Airbnb’s 18% of the time. Similarly, Airbnb cannibalizes extended stay options more, perhaps owing to the fact that a full lodging with a kitchen has a leg up on a hotel room’s mini fridge. As Airbnb expands, governments, lobbied by frustrated residents and hotel companies, may enact significant regulation on these types of lodgings, from meeting certain hospitality standards to taxes. However, Macquarie’s projections still show significant growth. A big reason is because it’s hard for governments to have the necessary information. “While data is readily available for rental availability, it becomes tougher to identify how many days accommodations are actually being rented out for,” the analysts wrote. “In recent months we have seen Airbnb directly ‘de-list’ hosts that offer accommodations across multiple properties but this has only occurred in NYC and SF. This supports our belief that the only way to limit commercial listings is for Airbnb to increase self-regulatory practices but this provides an obvious conflict of interest."